Los Angeles Lakers Rosters, Statistics, Records, News, and More! 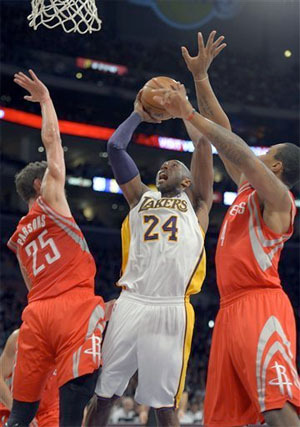 Kobe throws in two points on his way to a triple-double. The By The Numbers recap for the Lakers’ 119-108 win over the Houston Rockets at Staples Center on Sunday night. The Lakers are now 5-5, and next play home to Brooklyn on Tuesday night. The number of points Pau Gasol has scored in the NBA, as he passed the 15,000 point mark on Sunday, making him the 10th foreign-born player to do so. He has scored 6,039 of those points with the Lakers. The number of points the Lakers are averaging their last two games after having their first practice with Mike D’Antoni on Thursday. The number of points the Lakers starters scored on Sunday, with all five in double-figures, led by Dwight Howard’s 28 to go along with 13 rebounds and three blocks. Bernie Bickerstaff’s winning percentage as head coach, as he has gone 4-1 since Mike Brown’s dismissal. If Mike D’Antoni sits on the the bench Tuesday, Bernie will go down with the best winning-percentage in Laker coaching history. And if not for the the last 60 seconds against San Antonio he’d be a perfect 5-0. The Lakers first half scoring output, their best of the season. Seems as if the Mike D’Antoni system is really paying dividends on the offense the last two games. The number of rebounds Dwight Howard has pulled down the last four games, 14.5 per night. In the previous four, he’d only grabbed 32, including a season-low of seven against Detroit. The Lakers’ shooting percentage on Sunday, as they blistered the nets all night long. Every Laker starter shot better than 50% from the field, except for Kobe…and guess what he shot…yeah only 50% at 9-18. It was that kind of night. The number of triple-doubles Kobe Bryant has accomplished in his career, and his first since 2010. His line for the night…22 points, 11 rebounds, and 11 assists…and throw in three steals for good measure. The number of fouls the Lakers committed on Sunday, as they continue to play solid defense without fouling. And eight of their 15 fouls came from two players on Sunday, Kobe and Metta World Peace who each had four. For the second straight game, the Lakers won the turnover battle and committed just 13, with an assist/turnover ratio of 2.08. Great ball movement all night and lots of guys knocking down open shots. See you after Brooklyn, on Tuesday. This site is not affiliated with the Los Angeles Lakers or the National Basketball Association.